Heat oven to 400°F. In small bowl, mix melted butter, almonds and sugar. Spoon 1/3 of mixture into shallow baking pan; spread evenly. Bake 5 to 7 minutes, stirring once, until toasted. Set aside to cool, stirring once. Meanwhile, place pie crust in ungreased 9-inch glass pie plate; press crust firmly against side and bottom. Fold excess crust under and press together to form thick crust edge; flute. DO NOT PRICK CRUST. Spoon remaining 2/3 of almond mixture into bottom and up side of crust; press against crust. Bake 12 to 14 minutes or until golden brown. Cool completely, about 1 hour. 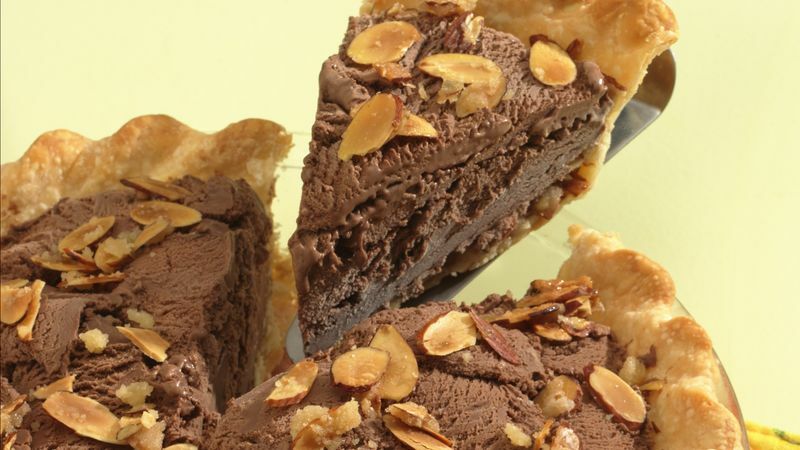 Spoon ice cream into cooled baked crust. Sprinkle cooled almond mixture over ice cream. Freeze uncovered until firm, about 4 hours. Let pie stand at room temperature 10 minutes before cutting. Pie can be stored in freezer up to 1 week. Substitute your favorite flavor ice cream or a different type of nut. Caramel ice cream and cashews are a tasty combo.